The month of May is full of family celebrations and parties--Mother's Day, graduations, spring weddings and Memorial Day cook-outs. In her post, Cheryce Berg writes about two parties and the best "party" invitation we will ever receive. I observed two parties today, one right after the other. All were invited, but only some came. 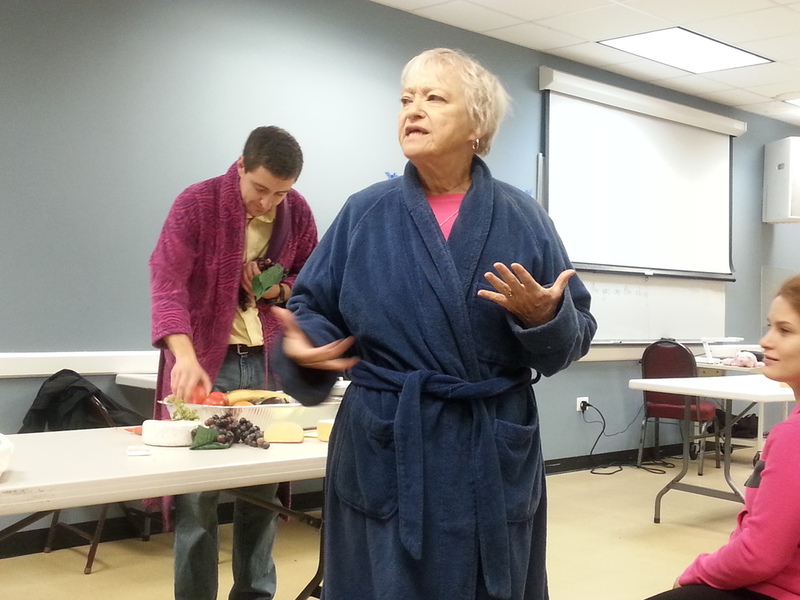 The first involved a story teller who wore a blue bathrobe--the "Jesus Robe"--and stood in front of dozens of adults from around the world. Whispers in many languages surrounded me as I studied the beautiful shades of brown skin and prayed for softened hearts to what what they would soon hear. The wine ran out, the coins were spent, and the so-called friends stripped the younger son of his robe and left. He begged for disgraceful work but soon grew tired of it, his belly craving something other than the pig food he had before him. Meanwhile, the father stood at home, his hands shielding the sun from his eyes so he could look the distance. Watching, waiting, loving, longing. The older son kept digging. The younger son came back slowly, dejectedly, begging. The father rushed to meet him and held him close, tears on both faces. Food was called for, robes were found, work stopped. There was love and laughter and forgiveness and grace. The older son was invited to join in, but he kept digging. The storyteller explained to my friends and me the love of the Father, the One who forgives and waits and longs for restoration. She told how all are invited, but only some come. She challenged those of us who are “older sons” to give grace and to welcome in those who need more forgiveness. She begged us to stop digging and join the party when they are restored. In silence, I prayed fervently for my friend at my side, wearing her Muslim head covering. I prayed that she would one day join the party and that I would be there to celebrate. The story ended and my friends and I walked to a different classroom for another party. Some things were the same: there was food, laughter, gifts and grace. It was the last day of ESL classes, and there were thank-yous to be said, certificates to be distributed and ethnic foods to be exclaimed over. We ate together, squeezing in last words and hugs, eyes meeting across the table in shared memories and laughter. I ached for my friends who didn’t come, who were too busy. They were missing the party. My heart felt full—of joy or tears—I couldn’t tell as I sat at the second party and reflected on the first. Who of these friends would join me at the final party, the day when we go home to the Father? Am I too busy digging instead of seeking them out to tell them he is watching, waiting, loving, and longing for them? Have I shown them his invitation to the party?